Owl is easily the smartest of the 100 Acre Wood bunch. He is often found sharing information with the other inhabitants whether they like it or not. Despite the fact that he can at times come across as a bit arrogant, he always has the best intentions at heart, and is always there to help his friends. Sora first meets Owl at Pooh's house. Owl is Sora's guide to 100 Acre Wood, he's always happy to explain to Sora the mini-games that he must take part in, and whenever Sora needs to find more torn pages. He also seems to be the only 100 Acre Wood character that is truly aware that they are in a storybook and that there are pages missing. Owl is the smartest one around in the 100 Acre Woods - or so he likes to think. People come to him for answers about anything and everything, but his answers can range from tales about his uncles, to downright gibberish. Regardless, he is an undeniable source of both wisdom and comfort and is held in high regards by his neighbors. 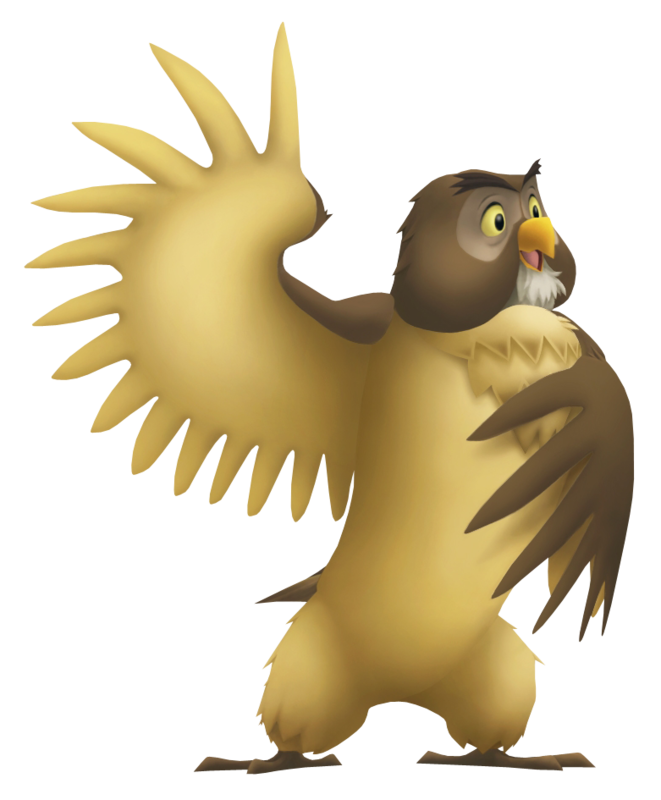 Owl, along with the rest of the animals living in the 100 Acre Woods, met Sora during the boy's first adventure. He met Sora once again when Sora restored the torn pages that made up Piglet's house, and has been traveling with him through the book ever since. As before, he is always willing to offer advice, and helps Sora help everyone on the 100 Acre Woods.